As wheat harvest continues in the Panhandle, now is a great time to evaluate weed control programs to determine what worked and what didn't this year. Figure 1. 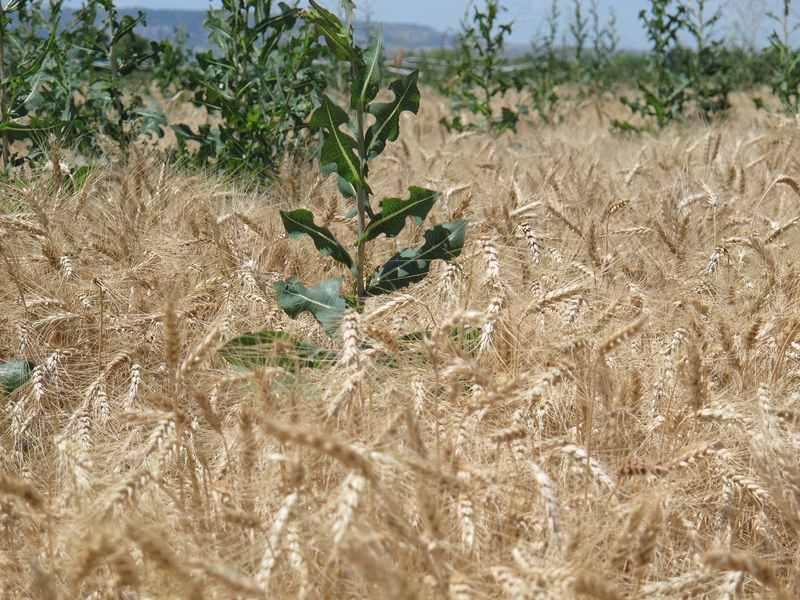 Green weeds extend above a mature, golden field of winter wheat prior to harvest. At this time of year, weeds that have escaped control begin to manifest themselves. They are easy to identify in mature wheat fields waiting to be harvested, and soon they will be prominent in other crops. In wheat, annual kochia, prickly lettuce, and feral rye are often visible from the road. Other weed problems may only be visible upon closer inspection because they grow near the ground or in isolated patches. This would include field bindweed or Canada thistle. Growers should review their field and application notes to identify possible causes of weed control problems. In some cases, it may be necessary to consult with your agronomist or another professional. Identifying the cause is the first step to correcting the problem now and preventing future problems. Harvest offers a convenient opportunity to identify problem weed areas. The vantage point from the cab of a combine provides the operator a unique perspective. Combine operators and growers should have a protocol in place to record and report problem areas to be treated later. Patches of weeds that are naturally tolerant to many herbicides, like field bindweed and Canada thistle, may need to be spot sprayed. Other patches could indicate the early onset of herbicide resistance. Either way, the weeds need to be treated to prevent seed development. Identify these areas, develop a treatment plan, and monitor them over time to make sure the problem is resolved. changing planting and spraying dates. Winter annual weeds like rye, marestail, and cheatgrass can usually be controlled effectively with fall and early spring herbicide applications. Actively manage weed problems now to prevent future weed problems and yield loss. One lone weed in an otherwise weed-free field may not impact yields this year or next year, but if not properly managed, it can spread and cause huge problems down the road.